The media industry is in a state of uncertainty, and publications are looking at multiple ways to monetize their online products. This information isn't new, but what's revelatory is that no one method has prevailed. One could theorize the future of online content will require a varied approach to revenue. That said, subscription billing will still play a major part. In fact, some media organizations have partnered with subscription services for an interesting and more lucrative take on traditional sponsored content. Publications have tried numerous ways to monetize their online content. The battle to successfully monetize online content has arguably followed media publications since they first started publishing on the web. Unfortunately, some of the most visible successes have been due to external factors. As Pew Research and others pointed out, certain U.S. newspapers saw a spike in subscribers after the 2016 presidential election. Though promising, this increase may not be enough to offset other troubles in the industry. Traditionally, publications have relied on advertising to fund their products. 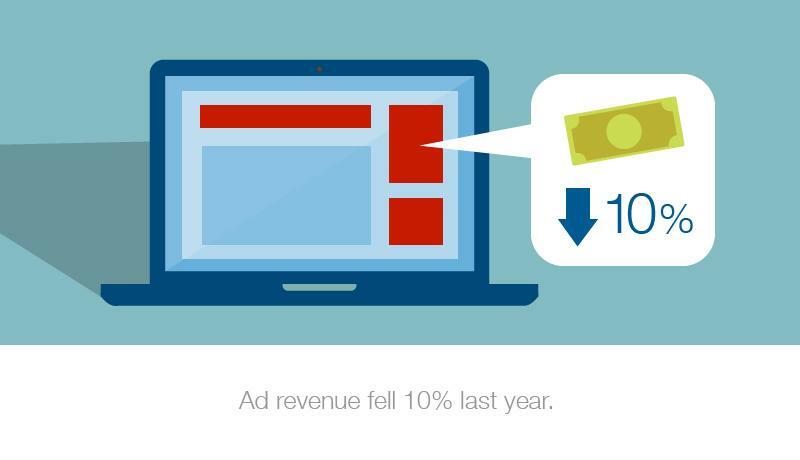 However, according to Pew, ad revenue fell 10 percent last year. As such, news and entertainment outlets have had to add other means of increasing funding. Some have adopted a multichannel approach while others target specific demographics. Additionally, some have used affiliate links, blurring the line between content and advertising. Affiliate partnerships were once mostly seen among personal blogs. To summarize, the publisher posts an article with links to specific products scattered throughout. When a reader clicks a link and purchases the item, the seller pays a small portion to the publisher. For example, a lifestyle website might post an article about choosing bed sheets and link to a specific set on Amazon. If a customer clicks through and purchases those sheets, Amazon pays the publisher a percentage of the sale. Affiliate linking can provide a small boost in funding, but it's difficult for large media corporations to sustain themselves using this method. That's because most payouts are miniscule, encompassing single-digit percentages of the total sale. That's why, as Digiday reported, some publishers are partnering with subscription services rather than direct retailers. Such services provide higher payouts and benefit by gaining new, long-term subscribers. Research from Pew indicates advertising isn't as lucrative for publications anymore. One of the benefits of affiliate marketing was that it allowed publishers to capitalize on their readers' interests. Bloggers - and eventually media companies - could review their analytics to see what types of content fared best with readers. They could then approach relevant businesses with this data and pitch sponsored posts to increase sales. This relationship worked both ways, and sometimes retailers would come to publications for sponsored content. Now, media publications can make those same pitches to subscription services, which tend to pay considerably more than retailers. As Digiday pointed out, publications might have gotten $8 or $9 per sale for sponsoring specific products. Sponsoring a subscription service, however, could bring in $80 for each transaction and provide a win for both parties. The service spends only $80 to acquire a customer whose lifetime value may reach the hundreds or thousands, and the publisher makes 10 times what it normally would have. This setup is especially beneficial for emerging and start-up subscription companies. The sponsored content acts as a stamp of approval from a reputable media source, so consumers feel more comfortable trying the services of a new business. Partnerships between subscription services and publications may not become the backbone of online media, but they are an interesting way to generate funding from online content. With online ad revenue not as lucrative as the industry would hope, novel approaches like these will likely become more and more common.